Say "Yello!" 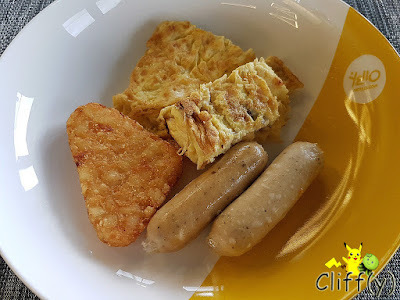 to yummy local dishes for breakfast! 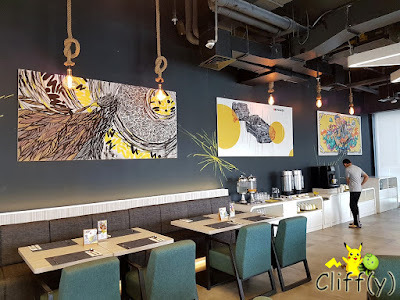 My BFF and I spent a night at the trendy Yello Hotel Harmoni (3*) in Jakarta, Indonesia before flying back to Singapore the following day. 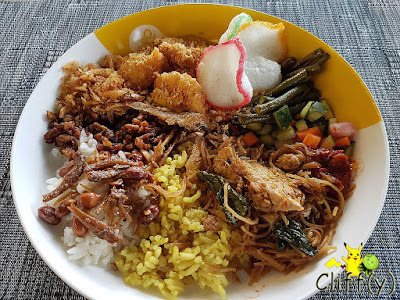 Given that yellow is its corporate colour, it's apt that the hotel serves nasi kuning (Indonesian yellow rice) at the buffet counter for breakfast. I was pretty satisfied with the nasi kuning as it was aromatic enough for my liking, going well with crispy fried tempe (lit. fermented soya bean cake) cut into small pieces. The fried vermicelli was tasty, going well with the refreshingly sour acar (lit. pickles). The cereal oat fish was a let-down though, while the onion crackers weren't that crispy. 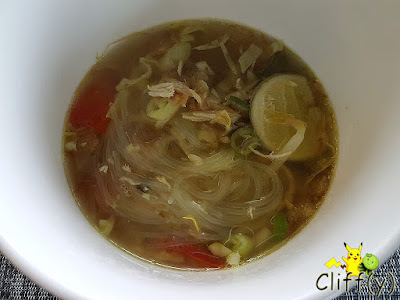 At first, I took just a little bit of the turmeric soup with rice vermicelli, shredded chicken and beansprouts. I decided to get a second helping afterwards as it was pretty delicious, even though there wasn't much of the white meat. 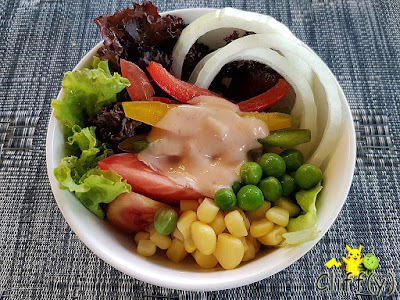 Quite a colourful bowl of salad with Thousand Island dressing, no? The canned corn kernels and green peas aside, the ingredients offered were fresh. In particular, the onion rings were truly sweet and crunchy. The omelette was quite dry, so it wasn't worth the calories. The black pepper sausages, on the other hand, were moist and enjoyably bouncy. The hash brown was crispy without being too oily. I ate the pancake, which was adequately fluffy, with butter and maple syrup. 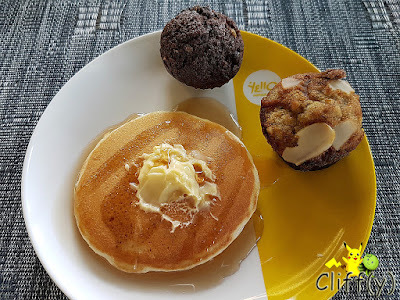 The texture of the chocolate muffin, as well as its banana and almond counterpart, was nicely dense and slightly crumbly. The oranges were the only ones worth taking. 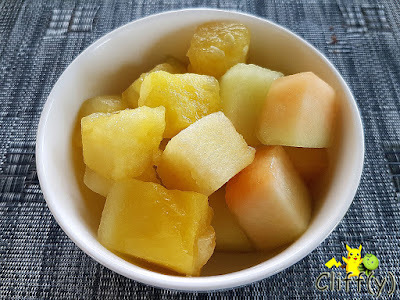 The dull-coloured honeydew and cantaloupe cubes weren't that sweet, while the pineapples were kinda mushy. The cappuccino had slightly too much milk, but I wasn't really complaining. 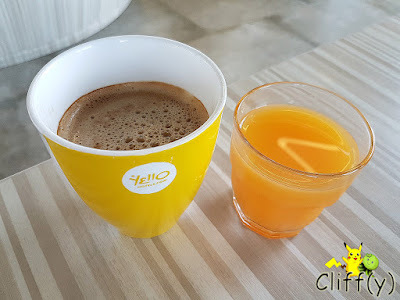 The orange juice was chilled well. The dining area is spacious, so you won't feel crammed even when there are lots of guests around. 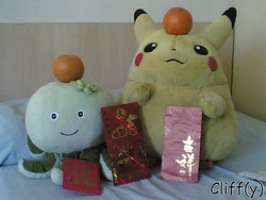 Pika's advice: The restaurant offers Express Lunch, which includes a main course, a muffin and iced tea, on weekdays from 12 noon to 3.00pm. It costs Rp 65,000 (~S$6.20).